This is a great sounding EQ with an enormous range of tone-shaping possibilities. Fire and Water: an innovative approach to change the shape of an EQ curve. Air and Earth: with their unique phase response these bands open up the highs and lows of any track. The Strength control allows you to easily adjust the overall effect of a complex EQ setting. Takes some effort to get used to it. Occasionally an EQ comes along that seems to offer something a bit different - like the AirEQ from Eiosis. At first glance it is a complex unit to get your head around. There are nine bands in total, two different ways of manipulating the EQ curve, stereo, dual mono and MS control options and a Strength setting that allows you to continuously vary the amount of overall equalisation. Starting with the five central parametric EQ bands, these do exactly what you would expect. Each has standard controls for gain, bandwidth and centre frequency and every band has the full range of frequency settings available. "There are huge tone-shaping possibilities from the subtle and smooth to hard and punchy"
Having set the individual bands, you can then affect the shape of the curves using the Character slider. Water flattens out the curve, making it sound more open and natural, like a smooth tone control; while Fire focuses it in, allowing for more detailed work. Moving outwards, the bands directly above and below are hi and lo-pass filters with switchable slopes (6 or 12dB) and bandwidth controls which further change the shape of the slope and can then place a peak at the filter point. External to these are the Air and Earth bands. 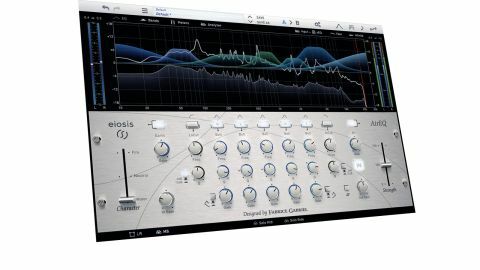 These are essentially hi and lo-shelf EQs with a fixed frequency that have a very smooth phase response which can really open up the low and high-end of a track without adding harshness or muddying the bass. Along the bottom you can swap between stereo and M/S mode and here some of the very useful control options come in to play. If you right click (Ctrl click) on the switch at the top of each band you get options as to how it behaves. In stereo mode this allows you to assign bands to stereo, left or right channels, and in M/S mode stereo, mid or side. We use so many stereo signals these days that it is especially useful to be able to control left, right or mid and side elements, especially with loops. Further to that, you can set bandwidth to bell or steep bell where you can get narrow enough to notch out problem frequencies, and you can disable each band from the overall Strength control. Changing an individual band's Character setting is done by shift clicking on the bandwidth knob. This is a complex EQ with a vast number of variables. While it may take a little getting used to, the results justify the effort. There are huge tone-shaping possibilities from the subtle and smooth to hard and punchy. The ability to swap bands into individual stereo elements makes it a very powerful corrective tool but it's the sound that will win you over. This is one of the best sounding EQ's we have used and it has gone straight into this writer's top three devices.